Built for creative agencies and designers. no matter the size of your project. Because websites need to be fast. The power of CI/CD at the click of a button. All the tools your team needs to collaborate. Build, manage and maintain your websites on a one-stop platform. Remove the hassle of setting up, managing and maintaining infrastructure. Spend minutes instead of days on DevOps and sysadmin tasks. Get back to what you do best and focus on delivering amazing websites. How much does Hyperlane cost? Anyone can test Hyperlane for free. Our production site basic plan currently starts as low as 25 EUR per month. Learn more on our pricing page. Can I easily migrate existing projects to Hyperlane? Hyperlane offers automated migrations for your existing WordPress project. No need for paid migration services or allocation of team resources. Hyperlane does the heavy lifting to make sure you are up and running within minutes. For more information, visit our documentation page. Which versions of Craft does Hyperlane support? Hyperlane supports the lateset releases of Craft 2 and Craft 3. Where are the Hyperlane servers located? 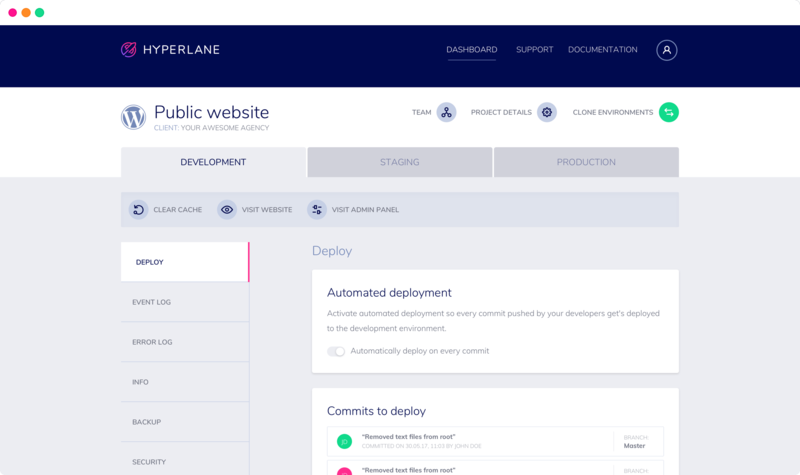 Hyperlane allows you to select between 8 different regions to launch your website: 3 in the US (East, Central and West), 3 in Europe (East, West and North), South-Asia and Australia. Should you have any specific requests around datacenter location, please contact us. Yes. Thanks to a fully automated integration with Let’s Encrypt, it is easy to secure your production site. Moreover, Hyperlane will make sure your SSL certificate will be renewed automatically.